47 pictures, black & white, color, digital and film formats. 20 companies are represented in this project, more will be added with time. Long term objective for this project is to become a time capsule about Work in Monaco nowadays. The goal of this project is to discover a neglected side of Monte-Carlo, which goes against the collective image of Monaco, summed up to money, games, races and parties. This gives value to the commuters who seize Monaco during their working hours. It’s a personal mission for Maxime to shine the light on all these hands who fully deserve it, either by the diversity of activities or by their craftsmanship. All these people form the basis of the local life, and furthermore, make up the “village spirit”. Maxime Ordureau’s artistic style is to photograph a scene as it is. It is only natural to photograph this whole project in the action without making people pose. Otherwise it would had given a fake feeling to the pictures. The fact that no other photographer has approached this topic, by doing it on such a large scale and diving deeply into the working lives, in order to bring out the essence of each company and profession, only makes it more interesting. This project has many great ambitions, especially in terms of communication for the Principality. Passionate and confirmed photographer, Maxime always pushes himself to go beyond the conventional, by always proposing a fresh and exclusive point of view on popular locations or topics. Born in U.S.A., Maxime mainly grew up on the French Riviera, spending a lot of time in Monaco. 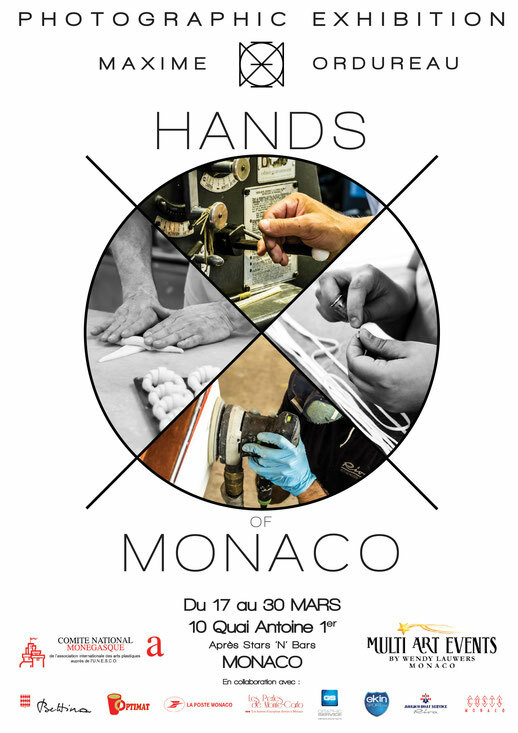 Accustomed to photographing landscapes, urban architecture and abstract, playing with the forms and light, this new exercise aimed at putting the human being in the spotlight was a new experience and challenge which resulted in this new exhibition “Hands of Monaco”. This project pushed him to become even more curious about the other side. Initially an artistic adventure, it became day after day a human adventure, marked by discoveries and throughout new humble meetings in this manual world, filled with complexity and pride for the work they do. While hoping “Hands of Monaco” will become a touring exhibition, the prolific photographer had a new exhibition already planned to take place the same year in Beaulieu-sur-mer: B.I.A.S. (Budapest-Ireland-Amsterdam-Singapore).